Obello Bay-ao’s father Benjo called on President Rodrigo Duterte to punish those involved with the extrajudicial killings, disband paramilitary groups, lift the martial law in Mindanao and resume peace talks with the National Democratic Front of the Philippines. 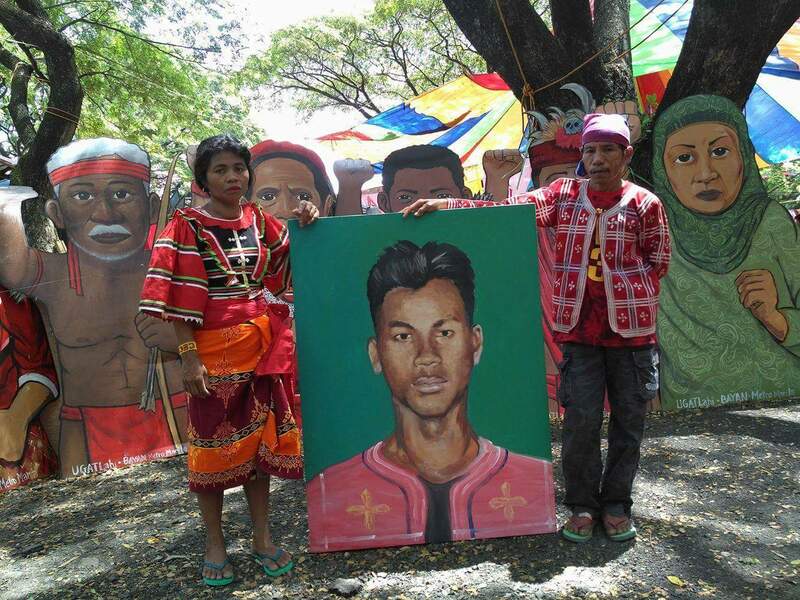 MANILA — The parents of the slain Lumad student Obello Bay-ao have traveled to the capital to demand justice for their son. Genia said she still could not accept that her son Obello (not Obillo as earlier reporter) is already gone. Obello, a Grade 7 student of Salugpungan Ta Tanu Igkanuon Community Learning Center (STTICLC, was shot by two elements of Alamara who have been recruited as Citizens Armed Force Geographical Unit (Cafgu) on Sept. 5 in sitio Dulyan, barangay Palma Gil, Talaingod, Davao del Norte. Obello was rushed to the Davao Regional Hospital in Tagum City but was declared dead at 9:15 p.m. on the same day. Obello’s father Benjo said they will file criminal charges against the perpetrators with various national government agencies. He fears that the case would be dead if filed with the local court in Davao del Norte. “Other cases of Lumad killings have gone nowhere,” Benjo said in the local language. In fact, one of the gunmen, Joven Salangani, has a standing warrant of arrest for the murder of another Lumad student Alibando Tingkas in 2015. According to Save Our Schools (SOS) network, Bay-ao is the 47th Lumad killed in Southern Mindanao alone. Not one of the perpetrators to these killings has been brought to justice. Benjo called on President Rodrigo Duterte to punish those involved with the extrajudicial killings, disband paramilitary groups, lift the martial law in Mindanao and resume peace talks with the National Democratic Front of the Philippines. “If he would not do these, the terror in Lumad communities would continue,” he said. The Bay-ao couple was among those barred by the airport police of the Davao International Airport from boarding their plane bound for Manila last night. They were joined by 30 teachers and students of STTICLC and Mindanao Interfaith Services Foundation, Inc (MISFI), another Lumad school in North Cotabato. They arrived at the camp site of Sandugo, an alliance of national minorities, at the University of the Philippines Diliman last night, Sept. 16. Benjo said the policemen discouraged them to go to Manila, telling them to report the incident to the local police. Genia said Obello went back to school because he dreamt of serving their community. Obello, 19, decided to enrol at STTICLC in June this year. In July, however, the school was forced to close down due to harassment from Alamara, which is closely linked to the military. After classes, Obello would help his father tend the farm. On the day he was killed, Obello, along with his father and his brother, just finished harvesting corn. Genia, a barangay health worker, said she could rely on Obello to rush some of their patients to the city using his motorcycle. Obello is fifth among seven siblings. In a statement, Rius Valle, convener and spokesperson of SOS Network-Mindanao slammed President Rodrigo Duterte for tagging Lumad schools as training grounds for New People’s Army (NPA). He noted that the attacks on Lumad schools have escalated after President Rodrigo Duterte ordered the bombing of schools on July 24.